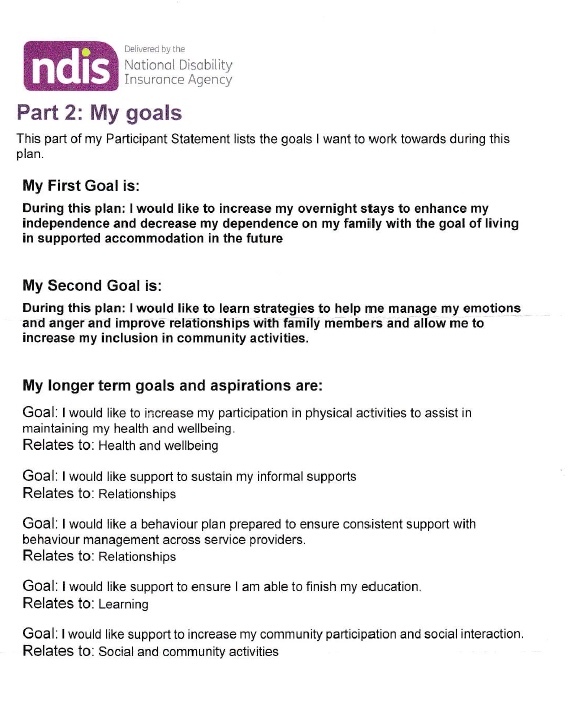 If you are not happy with the NDIS plan you receive, it’s possible to appeal the plan, or parts of it. In fact you can appeal any decision made by the NDIS. The process is actually called reviewing a decision. We will have an article to explain how to request a review next. In this case, we meet a family that felt their son’s needs and goals were not adequately funded. This is the story of Joseph, a young man of 17, who is severely affected by autism. His story is told by his mum, Maria, who is his main carer. “Joe is at school this year, in his final year. Joe is very severely affected by autism and his aggression can be very bad. He’s so demanding of me and he needs time out of the family. Short-term accommodation helps him become independent by becoming less reliant on the family. If we use in-home care and I am at home, he will not do anything with the carer at all and it makes it very difficult for everyone. This was one of his goals, to make him more independent. Before the NDIS, I did have a good flexible respite package and when our first plan came, we were given much less short-term accommodation than we needed. That first plan only gave him Core Funding which would equate to 28 days of short-term accommodation which was less than he had been getting. A lot of people seem to get Core Funding which would pay for about 28 days of short term accommodation when they first apply. That’s just not a lot if you have a very severe young adult. Joe needs to be out of the house more than that, he needs to engage with other people. So we asked for a review. I think we were lucky as the review just took two weeks and he then got a much larger amount of Core Funding which can be used for more short term accommodation, support workers or community access. Joe now receives $43, 670 in Core Support funding and we chose to spend a lot of this for short-term accommodation. During the review, we did let them know we were in crisis. How is the short-term accommodation used now? Now, Joe gets collected from school each Monday and stays overnight and then is taken back to school the next day. He comes home to us after school on Tuesday. Every second weekend he also goes to short-term accommodation. I feel this is a really good start for us. And we hope it will increase next year. Shared care is good for us. When he’s an adult if he gets into a routine of three-four nights at home a week and three-four nights in short–term accommodation, that would be ideal. Then, if anything were to happen to us, we know that he would be OK to go into care full-time. There is $6,400 for a behaviour plan with a psychologist. This part of our package is self-managed but the rest is managed by NDIA.